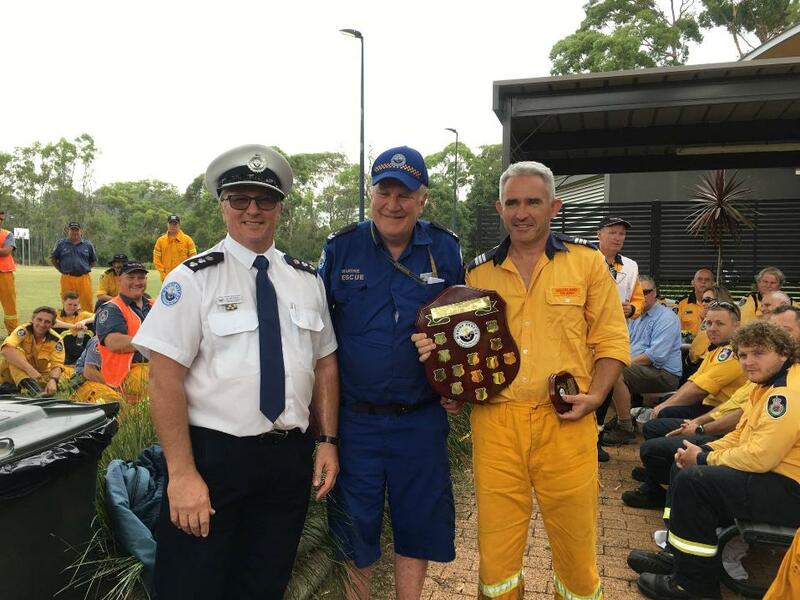 MRNSW Greater Sydney Regional Operations Manager Glenn Evans, MR Hawkesbury member Ken Bate presenting the Merv Collins memorial trophy to the Scotland Island brigade's Peter Lalor, Captain of Scotland Island RFB. 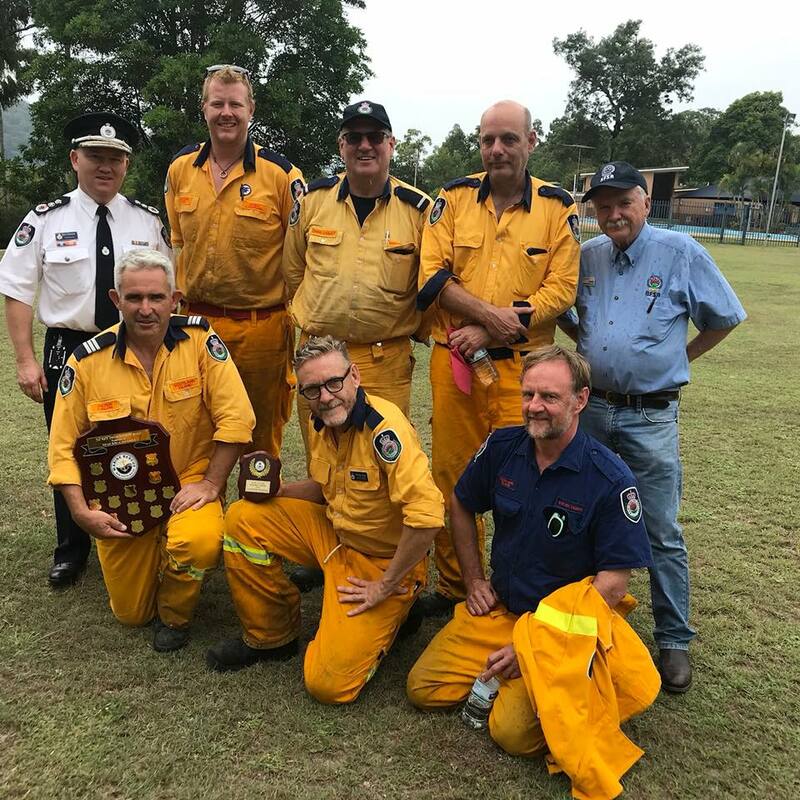 The Scotland Island brigade competed in the annual RFS Combined Districts Fire Boat Competition held at Milsons Island on the Hawkesbury River today and won the inaugural Merv Collins Trophy. The trophy is named after the late Marine Rescue Hawkesbury Unit Commander and 24-year service veteran, who passed away in 2017. SIRFB took the opportunity to practice using another boat - thanks to West Pittwater RFB. Ten RFS boats, four MRNSW vessels and more than 200 personnel took part in the event. Crews from Marine Rescue Hawkesbury, Broken Bay and Cottage Point joined their volunteer colleagues from the NSW Rural Fire Service for the training exercise today. Rescue vessels Cottage Point 31, Broken Bay 30 and Hawesbury 22, in company with Hawkesbury 21, under way on the river. The forced amalgamation of the Manly, Warringah and Pittwater councils and how to recover Pittwater Council were the focus of a forum at Mona Vale last Sunday. Also 'taking stock' is the Save Our Councils Coalition (SOCC). SOCC launched a 20 page review of the amalgamated councils across the state, Council Amalgamations a Sea of Red Ink, on Thursday at the NSW Parliament House. SOCC President Brian Halstead said: “It is scandalous that there has been little or no reporting of the results compared with the amalgamation proposal and the results compared with the standalone councils pre-merger. “The results for the Northern Beaches Council is that the 2018/19 Operating Profit before Capital Grants of $8.7 million is $7.4 million behind the Amalgamation Proposal and $5.4 million behind the results for the three councils in 2014/15 before merger." Mr. Halstead said. “The SOCC analysis shows that the combined study of metro council operating results will deliver a $114 million shortfall below the government’s $103 million surplus. The regional and country study of 13 mega councils shows a combined deficit of $48 million. With the $375 million grants and amalgamated councils receiving $15 or $20 million each, merged councils have been trying to win community votes with news of how they are spending grant funds, even while councils’ financial results are below what was promised." During the week Protect Pittwater President Bob Grace called on local residents to remember forced council amalgamations when they vote, Saturday week - March 23rd. “Everyone needs to understand that this present state government merged our councils and did away with the emergency department and other acute services at Mona Vale Hospital,” Mr Grace said on Thursday. “This is the last opportunity for four years that the people of Pittwater will have to make a stand over their council and hospital. One of the Speakers at the forum was Sue Young, one of the Pittwater Councillors 'sacked' by the forced amalgamation of Manly, Warringah and Pittwater Councils through the state government's Local Government (Council Amalgamations) Proclamation 2016 of May 12th. Sue provided a 'timeline' of what preceded May 12th, 2016. Pittwater Pathways film of Sue's recap runs above. Volunteer crews from three Marine Rescue NSW units responded to a Palm Beach ferry that had run aground at Half Tide Rocks at the entrance to Brisbane Water, at 6.50 p.m. on Saturday night, March 9th. The ferry service was on its last run back from Ettalong to Palm Beach. 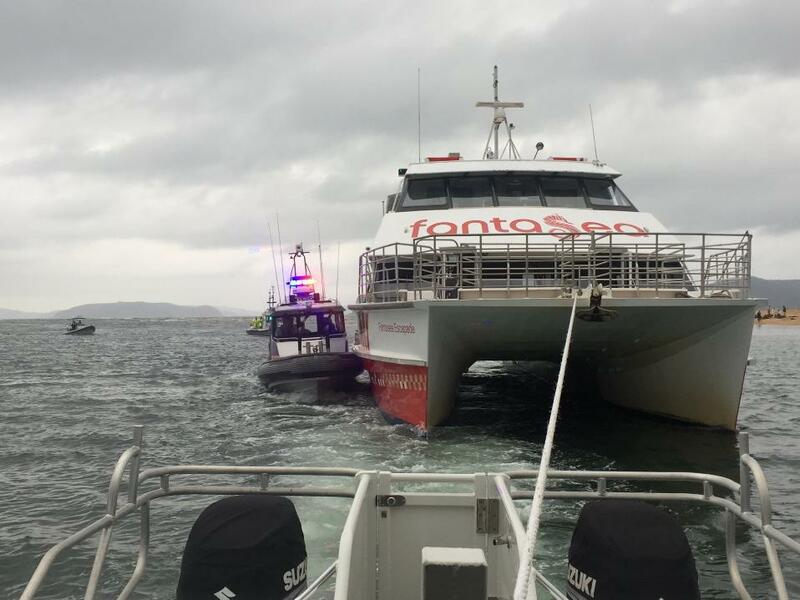 'The ferry that earlier ran aground at Half Tide Rocks at the entrance to Brisbane Water is now safely on an emergency mooring and all Marine Rescue NSW vessels have been stood down. The restoration of the service came after a dredge arrived on July 25th, 2018, which, then, was going to take around five weeks to complete works, and was followed by a September 2018 NSW Roads & Maritime announcement that up to $2.45 million will go towards an expanded dredging program in the entrance channel to Brisbane Water. The NSW Government was contributing $1.225 million, through the Rescuing Our Waterways program, towards a new long-term solution for Ettalong Channel. The works weer to be overseen by Central Coast Council. In November 2018 the Central Coast Council Mayor Jane Smith said that through a cooperative relationship, the dredging will continue beyond the initial emergency dredging. “The NSW Government will continue the dredging operations currently underway as part of the emergency works using Rescuing Our Waterways funding,” Mayor Smith said. “Of the grant funding announced in September, it is proposed to spend up to $1M this financial year, so we can get on with the longer-term dredging program as that is what the community want to see. “This will ensure the program continues beyond the emergency works and avoid additional mobilisation costs for Council. Local beaches will also benefit with approximately 20,000 cubic metres of sand dredged from Ettalong Channel to be placed on the Ocean Beach and Umina Beach areas. “We are committed to continue to work towards a long-term solution in the best interests of our community,” Mayor Smith said. The channel past Half Tide Rocks around Wagstaffe Point across to Ettalong Wharf has become unnavigable to ferries in the past. The dredging works undertaken last year follow on from similar works that were carried out in the same channel in 2013. On July 27th 2017 another Palm Beach Ferry ran aground at Box Head. In announcing the Zonta Club of Northern Beaches as those whose work was to be honoured this year, MP for Pittwater Rob Stokes mentioned Maybanke Anderson as one of our earliest advocates for the rights of women, including the right to vote, to divorce, to earn a living, to speak up and out for others. Volunteer members of the Zonta Club of Northern Beaches were today acknowledged as the first ever joint-recipients of the Pittwater Woman of the Year award. The annual award, which recognises the outstanding achievements and contributions of local women, was accepted on the group’s behalf by Club President Bernardine Guy. “This is one of the most energetic, passionate and effective volunteer groups in our community,” Rob Stokes said today. “With the loyal assistance of countless supporters throughout our community – the group has been able to directly assist women in our local area, as well as in remote corners of the world. “There’s no time wasting or hidden agendas with this group – they simply raise funds, raise awareness and provide support. “The work they do to fund, prepare and dispatch birthing kits to women in developing countries is not only inspiring – it’s also a powerful way of connecting communities at opposite sides of the world. “This award is a great way to acknowledge their inspirational efforts and the positive messages they spread throughout our community,” Rob Stokes said. To the Hon Mr Rob Stokes, thank you for this wonderful acknowledgement of “Pittwater Woman of the Year” award, by honouring the service and work that ZCNB does in our local community. I humbly accept this award as President of our Club on behalf of each member. Today we are here on IWD to celebrate women’s social, economic and political achievements and to call for gender equality. International Women’s Day began in 1911 a result of the upsurge of the suffragette movement in Austria, Denmark and Germany, when over 1 million women took to the streets demanding equal rights and the right to vote. IWD was adopted by the UN in 1975. Each year IWD has a theme and the theme for IWD here in Australia 2019 is “Balance for Better” representing a call to stand in unison for gender equality. Women and girls make up just over half 50.7% of the Australian population, and women comprise roughly 47% of all employees in Australia, they take home approximately $250 less than men each week. Over a lifetime in work this equates to many Hundreds of thousands of dollars in lost potential wages and more importantly Superannuation. The long-term outcome of this is that more women will live in poverty after retirement. We are now seeing more women in the over 55 age group of women, experiencing homelessness with this growing annually. The barriers to gender equality are many, some being that women tend to work in female dominated industries where the wages are lower such as child care, nursing and aged care. These professions are undervalued. On top of this women spend 64% of their working week doing unpaid care work. Generations of the Wye family. Photo by Michael Mannington, Community Photography. Dee Why’s main rockpool is now renamed the Isa Wye Rockpool in recognition of a local identity whose outstanding community service was marked by 85 years of involvement with the Dee Why Ladies’ Amateur Swimming Club. Isa Wye MBE OAM became the honorary secretary of the swimming club at just 16 and was club president for 50 years, remaining on the executive committee until her passing in 2013, aged 90. Mayor Michael Regan said Mrs Wye and her family were a driving force in Dee Why since the early 1920s with her family helping to establish the Dee Why RSL Club and some of the Northern Beaches most successful sporting and community organisations. “She along with several close colleagues and friends lobbied for the Warringah Aquatic Centre to be built in the late 1970s. She was also only the second Australian woman to officiate at an Olympic Games, attending the Moscow games in 1980,” Mayor Regan said. Stuart and Alex Wye and Mayor Michael Regan unveiling plaque design. Photo by Michael Mannington, Community Photography. Isa Wye was made a Member of the Order of the British Empire (1973) and was awarded the Medal of the Order of Australia 2002 in honour of her outstanding service to the community. Yesterday, Saturday March 9th, a Naming Ceremony of the Dee Why Rockpool after the legendary Isa Wye MBE OAM took place. Olympian and Dee Why Ladies Amateur Swimming Club champion Lisa Forrest, Mayor Michael Regan, Cr. 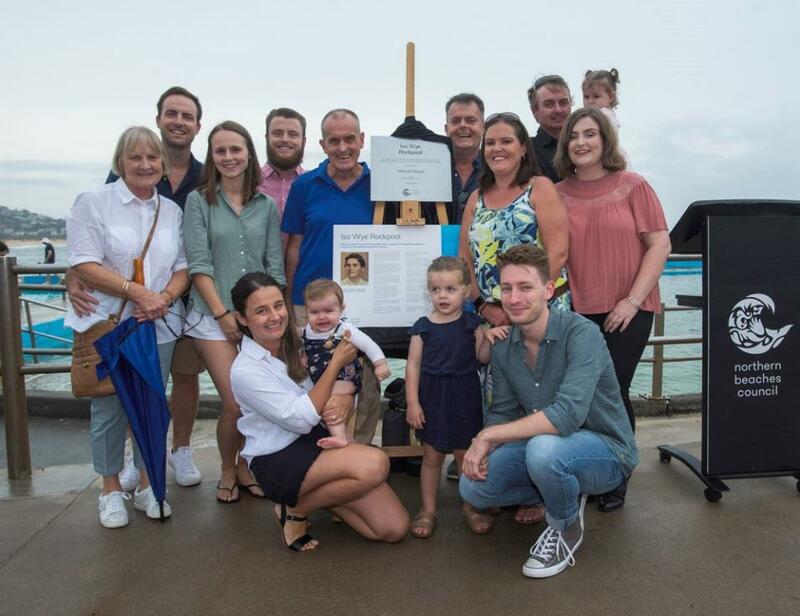 Vincent De Luca OAM, the Wye family including Isa's sons Stuart and Alex Wye and The Honourable Bronwyn Bishop celebrated this fitting tribute to a wonderful lady. Lisa Forrest OAM. Photo by Michael Mannington, Community Photography. In 1980 Isa became part of history when selected to manage the Australian Women's Olympic Swimming Team in Moscow. This was an extremely difficult time for swimmers and officials who were lobbied to boycott the Olympics because of the Cold War. "Isa and my late grandmother, Marjorie Smith OAM were the hearts and souls of the club for decades teaching thousands of kids and people how to swim and officiating both locally and across the Nation. They fought hard to get the Warringah Aquatic Centre and they both officially opened it as President and Secretary of Warringah Amateur Swimming Association respectively in 1979. They were trail blazers in the day, helping to bring the separate Men's and Womens' Swimming Associations together being Foundation members of Warringah and NSW Swimming Associations in 1965." Clean Up Australia Day 2019: Two Hours On Land And In The Water- An All Schools & All Peoples Pittwater Mission! Living in a coastal, lagoon and estuarine community means we're well aware how the tide may recede but also comes back again, often bringing a wave of rubbish with it. We know sea-breezes are great for catching our sails, but they also blow rubbish carelessly discarded across the parks and into the trees and sometime, into the waters. Commencing on March 1st at the Narrabeen Lakes Public School, who say; 'As our school lies between the lake and the ocean, we have a huge responsibility to keep our school and our surrounding community clean and green. NLPS is kicking off our 2019 sustainability program by hosting a Clean Up Australia Day event.' who were among many local schools who took to their playgrounds on that same day, and culminating with Barrenjoey High School’s Vice Captain and Ocean Lover (volunteer for Living Ocean, Sea Shepherd and BHS Sustainability Group Leader) Zoe Kemp taking part in Surfrider Foundation’s Clean Up Australia Day on Sydney Harbour last Sunday as part of the 30 year anniversary of that first harbour cleanup! The sky’s were clear and ‘Ian’ was most definitely looking down on us smiling from ear to ear. Surfrider Aus together with all our beautiful support group, who made this event so majestic, put on a display of true RESPECT and POWER. The truly beautiful Opera House was definitely overshadowed by the character of our participants and the strength of PEOPLE POWER. Surfrider Australia would like to thank and give huge hugs to every single person who helped make this day happen. You are all Legends and you will never die. Sunday was the 30 year anniversary of Clean Up Australia Day 2019! Bittersweet in many ways. A moment of silence for Ian Kiernan, Clean Up Australia founder and tireless ocean eco warrior. Then the hard work of cleaning our precious Harbour...still! Incredible work from the free divers who collected garbage from the sea floor; thank you surfers, SUP boarders and kayakers for collecting; Surfrider Foundation Australia for organising, our Ambassadors, friends and families for making it such a heartfelt event. 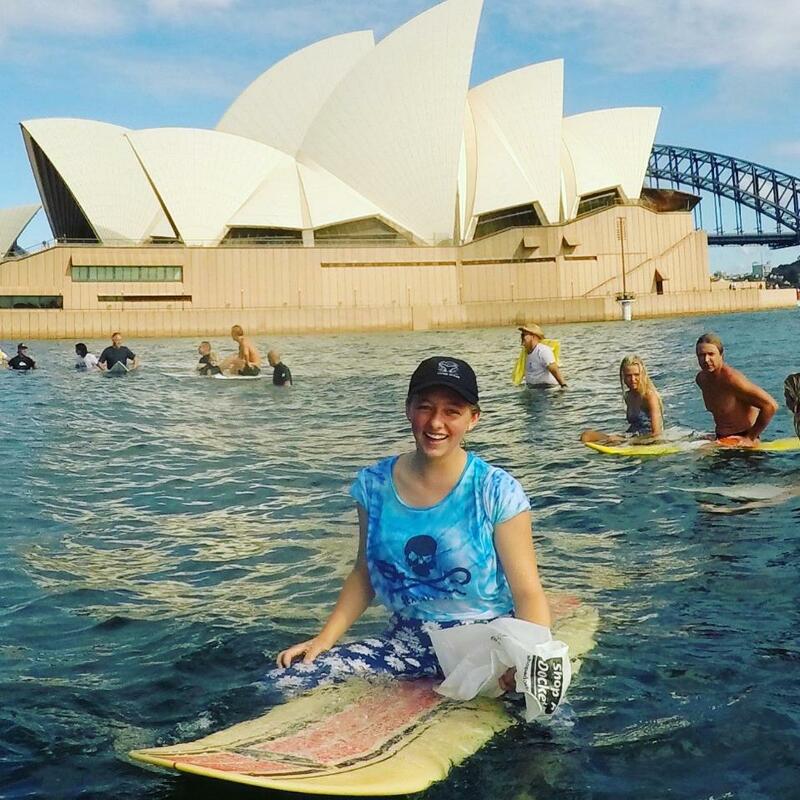 Surfing World Champs, Tom Carroll, Rob Bain and Surfing legend Simon Anderson were among the 'fleet' aboard the Clean Up Sydney Harbour event. 'A huge thank you to the more than 680,000 volunteers who rolled up their sleeves yesterday at over 6,830 sites around the country as we continue his work into the future. Surfriders Australia, along with an incredible group of world renowned surfers, volunteers and divers held a paddle out and shared a minute of silence in tribute (to Ian Kiernan AO 1940-2018). We thank everyone who made yesterday possible and all the volunteers who have helped make Ian’s vision a reality for the last 30 years. Littlies, biggies, the very young and the slightly older all did their bit last weekend - others did their bit on the Sunday, across Pittwater. Pittwater Natural Heritage Association (PNHA)'s Cleanup Australia Day was focused on the Careel Bay mangroves and saltmarsh which is now looking better thanks to our clean up site with 10 helpers at end of William St Avalon, being 'relieved' of its rubbish. PNHA photo: Gillian May with her prize find. For some a first visit to this lovely area of Pittwater.